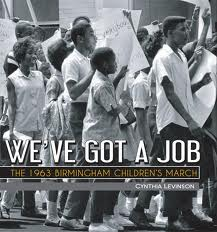 We've got a job: The 1963 Birmingham Children's March has been getting rave reviews since it's release the last few weeks. It is a moving and historically significant book. I absolutely loved it after I got over my embarrassment for not knowing anything about this important event. Peachtree Publishers has generously offered to give a hard copy of this beautiful book to one of my readers. This is definitely a book giveaway you have to enter. The photos in this book from the Civil Rights Movement are incredible. **Disclosure: I received a copy of the book for review purposes only from the publisher. This in no way influenced my opinion of this book. I do not accept books for review in which I am asked to write a positive review. The publisher will be providing the book to the contest winner. I did not receive compensation of any kind to review and host a giveaway for this book. Contest Details. Giveaway begins Jan. 31, 2012 and ends February 14, 2012 at 10:01 MST. Contest is sponsored by the publisher. Blog owner is not responsible for sending prize to the winner. Please use the Rafflecopter form for the giveaway. Giveaway is open to U.S. residents only. See additional details on Rafflecopter form. I was not aware of Project C or its purpose, to fill the jails with civil rights protestors so their cases and voices would be heard in court. Thanks for hosting this event. I learned that children had a critical role in desegregating Birmingham. I learned that cynthia used to be a history teacher. The author learned about Audrey, Wash, James, and Arnetta through the Birmingham Civil Rights Institute, which has an excellent collection of interviews with activists. I like that she felt inspired to teach us what she hadn't known. Also-super cool she used real people, met them, and walked the march. I learned from the review that this is story of the courage of people to stand up to inequality and that you highly recommended it for adults as well. The youngest participant was only nine years old. I learned that the author is a former American History teacher. I learned the author worked on this book off and on for four years! It took about 4 years to do this project. There was about 18 months it sat on the shelf.